Florida ranks above the national average of the percent of children between the ages of 10-17 who are overweight or obese. Nationally, one out of three children or adolescence are overweight or obese, with numbers continuing to grow. The Centers for Disease Control and Prevention found that childhood obesity has more than doubled in children, and tripled among adults in the past 30 years. This epidemic has made obesity the number one public health issue in America, ranking over drugs and alcohol. To fight this battle, a local family may start from a root… a plant root that is. One local garden uses the love of a family to grow more than just food. Zoe’s Edible Garden was created by Tyson and Sommer Grant out of love to honor Zoe Grant, their daughter. Zoe passed away just a month after she was born in 2009. A room in Bayfront Medical Center is dedicated in her honor, but the family wanted to do more. 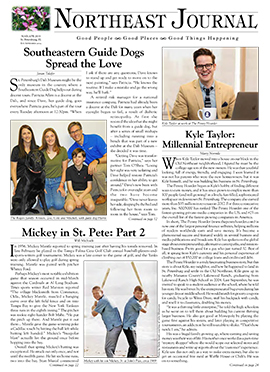 Tyson Grant is a well-known resident, executive chef and partner at Parkshore Grill in St. Petersburg. His passion for the culinary world intertwines with the living memorial in honor of Zoe. Connecting his knowledge of food and taking an idea similar to the Edible Schoolyard in Berkeley, California, a living memorial garden was created. Tyson believed creating a garden that cultivated life and education was a great way to give back to the community. At the opening on May 3, 2011, butterflies were released in honor of Zoe. The garden was created to foster an environment for kids to learn about where fruits and vegetables come from, and how to foster a health-promoting diet. It serves as an escape for some and a learning tool for others. Patients and family members at All Children’s Hospital get a chance to step outside into the sunlight to escape what trouble may be inside. The garden provides something to take their mind off what is happening at the hospital, breathing both life and encouragement into those patients. Children from different areas of the community come to get their hands dirty while partaking in an educational experience. Working first-hand with fresh vegetables directly taken from the garden, students learn to incorporate them into a dish they prepare. Cooking demonstrations show the current generation of those fighting obesity the ins and outs of how to garden and how to cook with what you grow, all while interacting with nature. Zoe’s Edible Garden is partnered with All Children’s Fit4AllKids. The program “From Dirt to Plate” gets students to grow their own food and take the produce from the dirt to their plate. Of course, the vegetables are cleaned and prepared. Overall, it’s all about getting families back into the kitchen using fresh produce and focusing on choosing healthier food options. 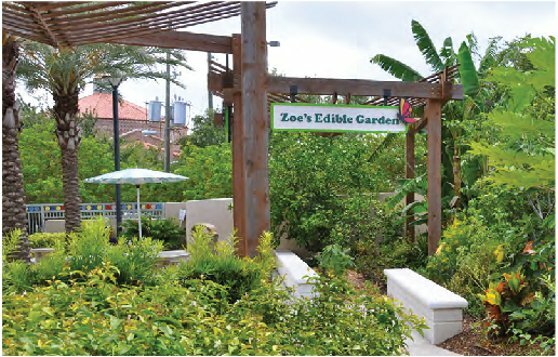 Change is occurring in Pinellas County, with Zoe’s Edible Garden acting as an ingredient to a countywide effort fighting child obesity. The programs working with the garden are rooting into the community, creating a movement of change by starting at the beginning of a child’s life to prepare them for a positive future. Pinellas County Schools are making an effort to fight the epidemic. Nutrition education, healthier food options, and increasing physical activity among students are just some actions taken. St. Petersburg teacher Jennifer Velez was honored as Healthy Schools Program Champion of the entire state of Florida. And, just this past year, students from Pinellas County Middle School used vegetables that they had grown in the school garden and while teaching other students how to cook with the ingredients for the first time. It goes to show that every little ingredient is a key to the entire product. Zoe’s Edible Garden is the ingredient for change that is blooming in the area, influencing and educating children for generations. Whether educating children or serving as an escape, the garden cultivates hope, grows life, and produces a product for a better tomorrow. Ashleigh Powers recently graduated from the University of South Florida. Born and raised in Amelia Island, she will always be a southern belle who loves the sunshine. Ashleigh works as a research assistant for distinguished professor of public administration and political science, Dr. Susan MacManus, and has worked alongside her while authoring publications including a chapter from her recent book Barack Obama and the New America; The 2012 Election and the Changing Game of Politics. Ashleigh aspires to be a multimedia journalist, and desires to travel the world. This news junkie finds pleasure in discovering and learning new things daily. With high ambitions and a positive outlook for the future, Ashleigh is a young professional ready to begin the next chapter in her life. She is honored to have the opportunity to write for the Northeast Journal.